Click on the small folder next to “Settings” to access the settings of the Notes menu. All note pages have the same heading (the note heading). The dropdown next to Period end options allows you to change the wording of the period end date in the note heading. 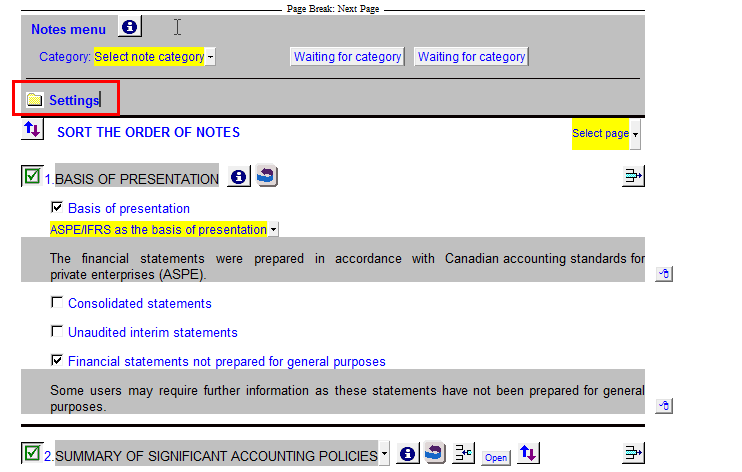 The dropdowns under Note and policy headings control the presentation of headings on individual notes and policies. The buttons next to “Note headings” describes the current presentation setting for all note headings. Clicking the buttons will toggle the setting. In the example below, Note headings are currently set to bold and lowercase. The alternative settings are unbolded and uppercase. 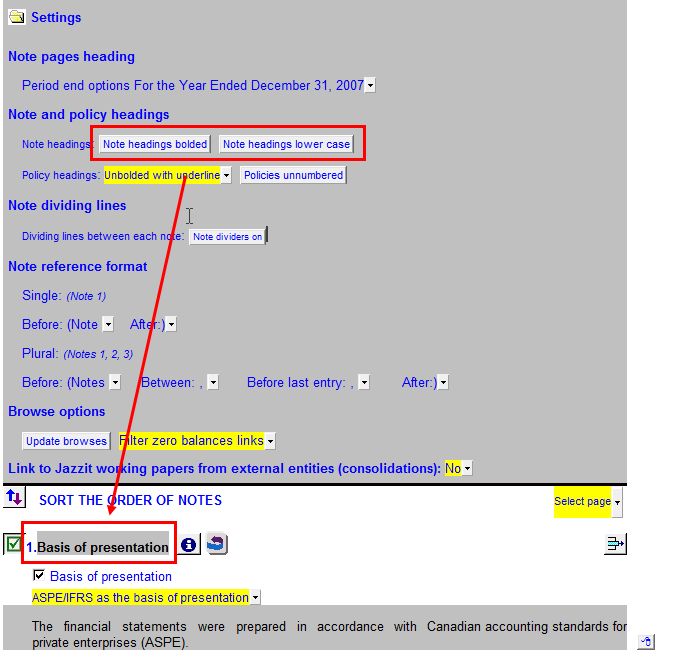 The button and dropdown next to Policy headings” describes the current presentation settings of the policy headings. Policies only appear within the Summary of Significant Accounting Policies note. Click on the dropdown or button to change the setting. In the example below, Policy headings are set to italics with no underline and policies numbered. Note dividing lines are the thick lines that appear between individual notes. This can be disabled or enabled using the button next to Dividing lines between each note:” The current status of the note dividers is written on the button itself. Note: This option was formerly located in the Statement menu (table of contents). 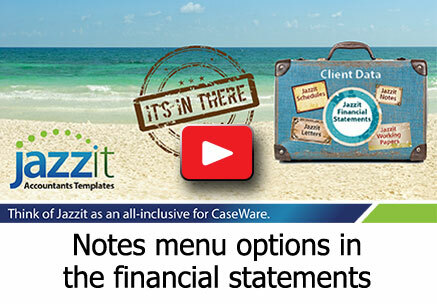 The Note reference format settings affect the appearance of the note references that are displayed in the main financial statements (Balance sheet, Income statement and Cash flows). 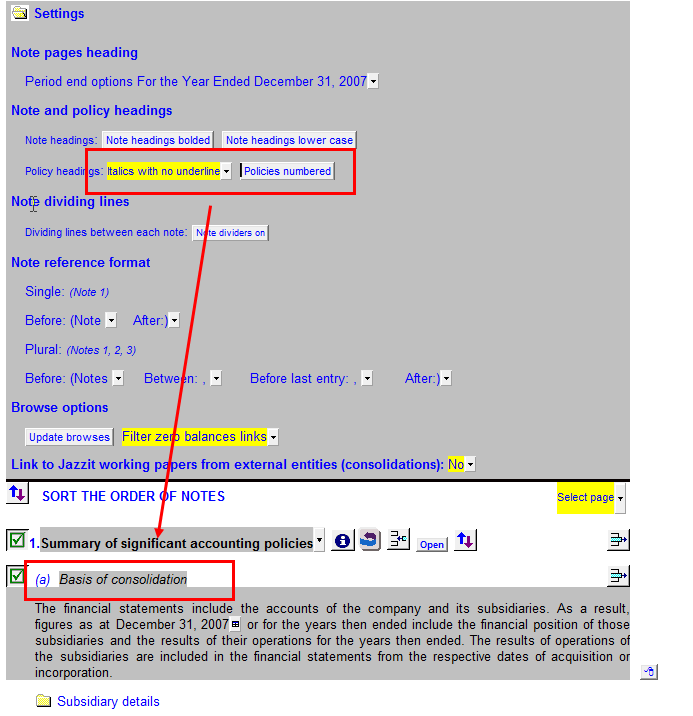 For convenience real-time examples are displayed in the Note reference format area. The examples will change as you change the formatting options in the adjacent dropdowns. The options are divided between single and plural. When there a note reference on a line item is referencing more than one note, it is affected by the plural options. Otherwise it is affected by the Single options. 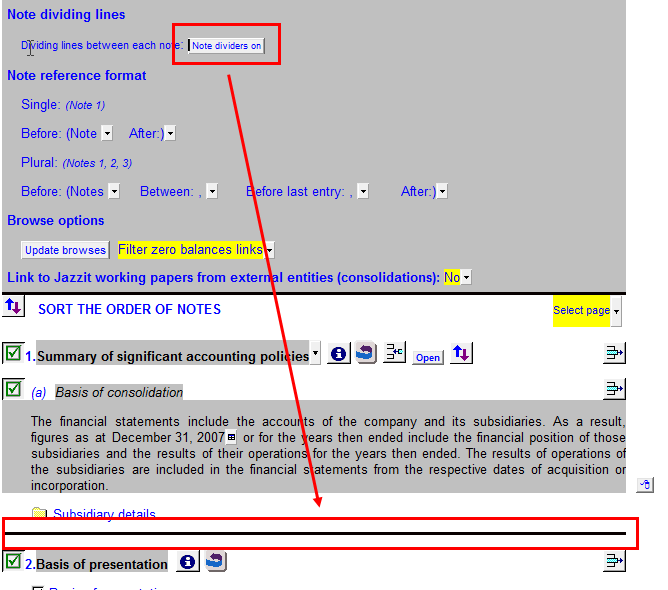 In the example below the “See note” has been changed to “(See note” for Single references. Plural references have been changed to “(See notes”. The changes are reflected in the balance sheet. By default, zero balance map numbers will not appear when selecting link numbers in the notes. If you want to see the zero balances. Set your browse option to ‘Show zero balance links’ and then click on ‘Update browses'. Specify the external entities (CaseWare files) you want to link the notes to (see below). You will need to use the CaseWare consolidation feature (Engagement > Consolidate) to have the external files appear as options. 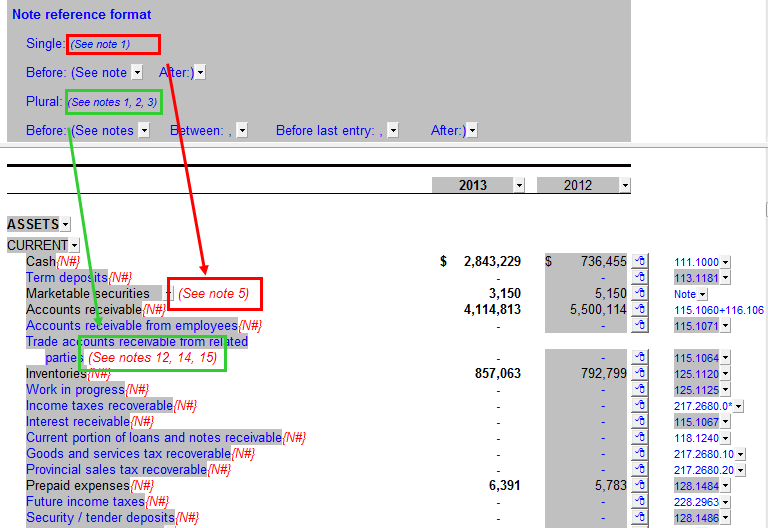 You can now select external entities in the notes that support this feature (Ex: Generic note 2B).